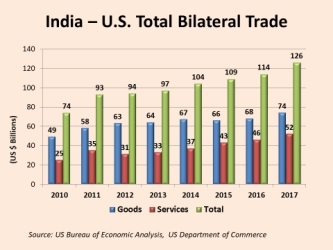 Rapidly expanding trade and commercial linkages between India and U.S. form an important component of the multi-faceted partnership between the two countries. Total bilateral trade (goods and services) between India and US increased at a CAGR of 11.4% from $20 billion in the year 2000 to over $126.1 billion in the year 2017. 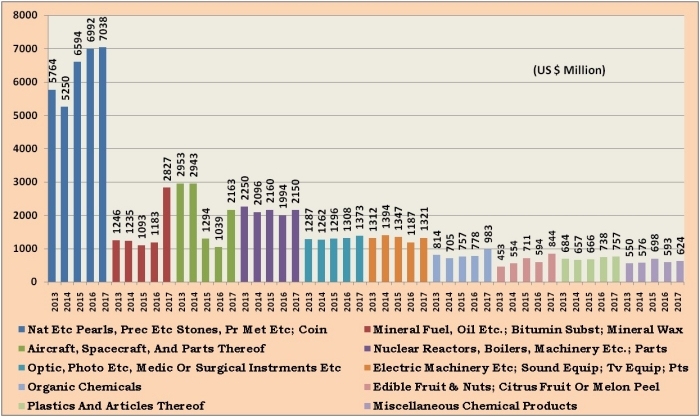 In this period, the growth in bilateral trade was accelerated by services trade, which grew at a CAGR of 13.5%. Goods trade grew at a CAGR of 10.2%. During the year 2017, goods trade contributed to 59% and trade in services contributed to 41% of the total India-US bilateral trade of $ 126.1 billion. Goods Trade: Starting from a modest $ 14 billion in 2000, the bilateral trade in goods has increased to $77.3 billion in 2017 (CAGR of 10.3%), making U.S. our second largest trading partner. Of this, India exported $48.6 billion to US and imported $25.7 billion from US. Trade in goods during the year 2017 was $74.3 billion as compared to $67.7 billion during the year 2016, which is an increase of 9.8%. Trade in Services: Bilateral trade in services has grown at a very fast pace since the year 2000, increasing from a mere $6 Billion in 2000 to $51.8 billion in the year 2017 (CAGR of 13.5%). 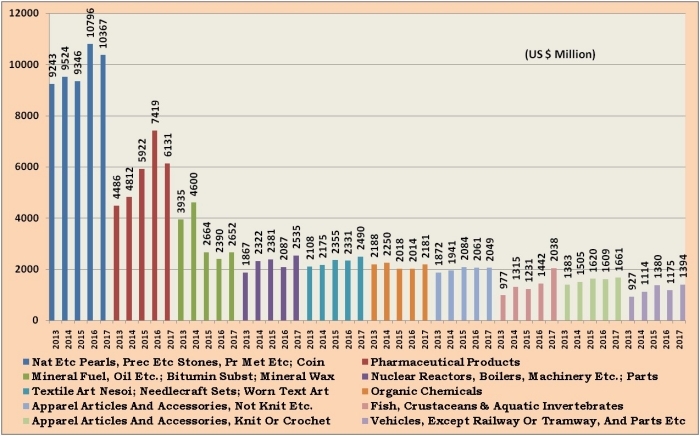 Of this, India’s exports of services to the U.S. were valued at $28.7 billion and India's imports of services from US were valued at $23.1billion.Trade in Services during the year 2017 was $ 51.8 billion as compared to $ 46.4 billion during 2017, which is an increase of 11.5%. Apparel Articles And Accessories, Not Knit Etc. Top 5 Competitors of India’s top 5 Exports to the U.S.
As per FDI statistics released by DIPP, the U.S. is the sixth largest source of foreign direct investment into India. 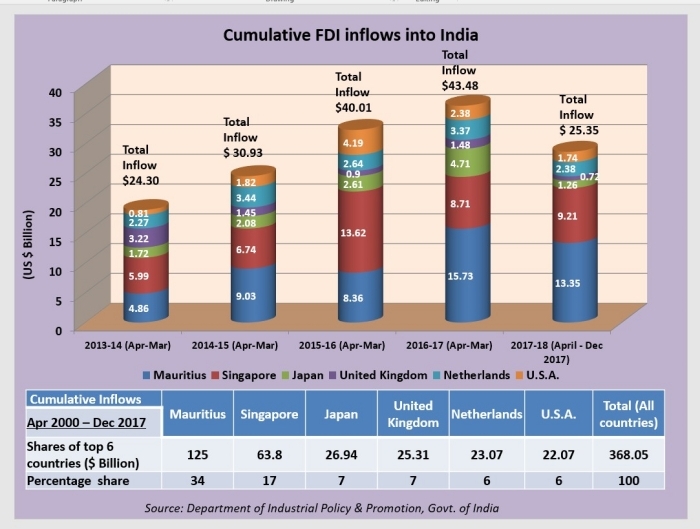 The cumulative FDI inflows from the US during April 2000 to December 2017 amounted to $ 22.06 billion constituting 6% of the total FDI inflows into India. During the latest fiscal April 2016 – March 2017, FDI from US stood at $ 2.38 billion. According to CII survey report released in August 2015, 100 Indian companies have made $15 billion worth of tangible investments across 35 states, creating more than 91,000 American jobs. Among large Indian corporations having investments in the US are Reliance Industries Limited, Tata Consultancy Services, Wipro, Essar America, Piramal, Mahindra, Lupin, SunPharma, etc. U.S. FDI in India during 2005 to 2016 amounted to $ 32.9 billion whereas Indian FDI into the US between 2005 and 2016 amounted to 12.1 billion.